DA Arrears Instructions: GO.135 New DA 2.096% to TS Employees from 1st January 2017(Present New DA 24.104%): GO.135 DA 2.096% Sanctioned to TS Employees from 1st January 2017(Present New DA 24.104%): TS #GO.135, Present New DA 24.104%, #DA enhanced from 22.008%(Old DA) of the basic pay to 24.104%(New DA) of basic pay from 1st January 2017, TS GO.135, Dt.22-09-2017, DA enhanced from 22.008%(Old DA) to 24.104%(New DA) , Arrears : 1st January 2017 to 31 August 2017 to GPF, Cash from 25th September, 2017, DA 2.096% enhanced from 22.008%(Old DA) to 24.104%(New DA) from 1st January 2017. 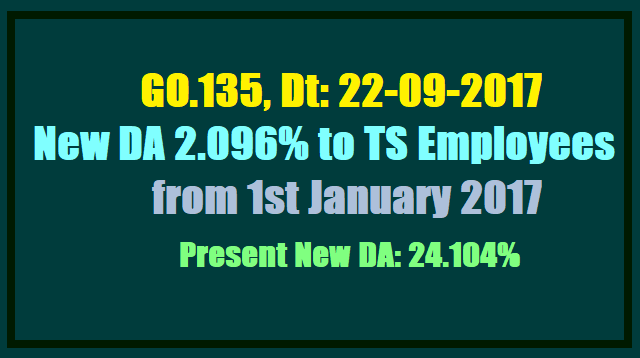 DA enhanced from 22.008%(Old DA) to 24.104%(New DA)- #Present New DA:24.104%: TS Government has sanctioned the Dearness Allowance (DA)(2.096%) to the employees of Government of Telangana State from 22.008%(Old DA) of the basic pay to 24.104%(New DA) of basic pay from 1st January 2017. TS Govt enhanced DA to State Employees and Teachers. DA GO Ms No 135 Fin Dept dated: 22-09-2017 released. 2. Employees who are Governed by CPS 10% of DA from 1st January 2017 to 31st August 201 shall be credited in to PRAN A/Cs. And remaining 90% of DA arrears shall be paid in cash. Memo No. I/4996/2017 Dated: 07.10.2017. Sub:- P. S -T &A Dept - Dearness Allowance to the State Government Employees from 1st of January, 2017 - Instructions issued. - Regarding. The attention of all the Deputy Directors/District Treasury Officers of State is invited to the subject & reference cited. They are to inform that the GO for DA enhancement is issued on 22.09.2017 and by the time the hard copy is received, most of the DDOs have processed their monthly salary bills for the month of September 2017 in the ODO Request and obtained token numbers. Hence, the DA arrears amount of an employee includes both the Adjustment (from 01.01.2017 to 31.08.2017) and Cash payment (for the month of September 2017) components. The Software Programme prepared for· processing of DA Arrears was developed in the year 2008. The Programme allows the payment of both the GPF Adjustment and Cash payment components of DA arrears in the same month. ii. both the Adjustment and Cash payment components of DA arrears are to be paid in different months in the case of CPS Employees i.e. 10% of Pay +DA to be adjusted to the PRAN accounts of subscribers along with salary bill for the month of September on 25th September, 2017 and the remaining 90% of Pay+ DA shall be paid in Cash after 01.12.2017. Keeping in view of the above, as per the software programme available, the followinginstructions are issued. The DDOs can prepare the monthly salary bills of all the employees (both regular GPF account holders and CPS employees) with the enhanced DA rate through HRMS package. package and shall present in the month of October 2017.
ii. The arrears from 01.01.2017 to 31.08.2017 shall be credited to the respective GPF accounts of employees and the arrears for the month of September 2017 shall be paid in cash to the employees. package and shall present in the month of December 201 7.
ii. 10% of the DA arrears for the period from 01.01.2017 to 30.09.2017 shall be credited to the respective PRANaccounts of subscribers along with matching Government Contribution and remaining 90% of DA arrears amount shall be paid in cash to the employees. The ODs / DTOs in the State are instructed to communicate the above instructions to all the Sub Treasury Offices with an instruction to inform the same to all the DDOs under their jurisdiction and admit the bills accordingly.